I found the item below in a vintage Blue Book Magazine. Stories of Adventure by Men for Men! (I rearranged the pictures a bit to fit on one slide). It was part of a feature in this magazine to promote their authors titled “Who’s Who in this Magazine”. 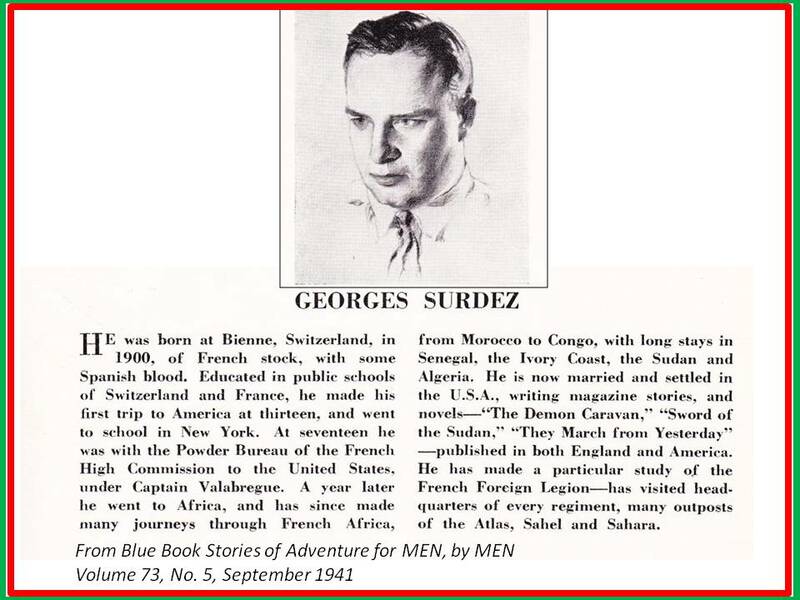 George Surdez, for those who don’t know, was a pulp fiction writer who specialized in writing adventure stories that often took place in North Africa and usually featured the Foreign Legion. He was born in 1900 and wrote fiction from as early as 1922 right up until his death in 1949. He penned several novels such as the The Demon Caravan, Swords of the Sudan and Homeland (a novel of his upbringing in Switzerland). Like many Swiss, he was probably fluent in German and French and this helped him on his visits to Algeria where he was known to associate with the Foreign Legion at various posts. It was also said that he was made an honorary Legionnaire. Some of his stories were made into movies–a non-Foreign Legion story called A Game in the Bush was filmed as South Sea Love in 1927 while his novel The Demon Caravan was released as The Desert Legion and starred Alan Ladd. A couple of good links to online bibliographies can be found here and here. Georges Surdez, along with J. D. Newsom, Robert Carse, Theodore Roscoe, Bob (Robert) Du Soe, and P.C. Wren probably account for 98% of all pulp stories written about the Foreign Legion. UPDATE: I came across another great web page that discusses Georges Surdez and his role in the notorious practice of “Russian Roulette”.